Established in 1885, the splendid city of Coquille, Oregon is the county seat of Coos County, and provides its residents with a family friendly environment and a charming small-town atmosphere. Just half an hour from the coast, this city is known for its mild climate and protected location next to the Coquille River. Families will love the hospitality of this city, as well as the important amenities that it provides. With its own hospital and emergency care facilities, as well a quality schools and programs, Coquille is a great place to buy a home. Homebuyers will love the variety of real estate options available in Coquille, with home prices ranging from just $45,000 to $2,825,000. Whether you are looking for a spacious family home surrounded by friendly neighbors, or a cozy cabin located on a spacious lot on the fringes of the city, Coquille has the perfect choice for you. The warm summers that come as a result of Coquille’s protected location make it the perfect place for festivals and events. One of the most popular celebrations of the year is held on the first Saturday in June, and includes a large craft show, a variety of food stands, as well as games and a 5k run. This city also possesses an excellent Community Center, which features a pool and programs for residents. Coquille is known for having lots of amenities, low crime rates, and spectacular scenery, which is prospective homebuyers would be remiss not to consider the real estate options of Coquille when looking to relocate in Oregon. 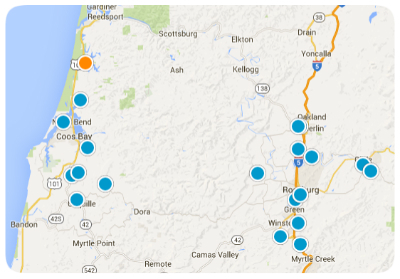 Feel free to contact us today if you’re interested in buying a home in Coquille, Oregon!